Volleyball Transition Drills | How to Improve Offense? Volleyball Transition Drills - How to Improve Transition? Read about volleyball transition drills to improve your offense. You find transition drills for the team practice – as well as how to improve transition by yourself. Volleyball transition is one of the few volleyball skills, which can make a huge difference in your game, even when practicing it without the net or ball. You could do these following volleyball transition drills for example on the track in the summer time, if you can’t get in the gym. So, you don’t necessary need a net and a court to practice these three scenarios. Weather you do these three scenarious on or off the court, you have to use visualization techniques and your imagination in this drill. As mentioned in other sections this visualization helps you to learn skills quicker. You need to imagine yourself in the match when doing the drills by yourself. Picture yourself in the match. Take your position as the outside hitter when you are ready to block the opponent. 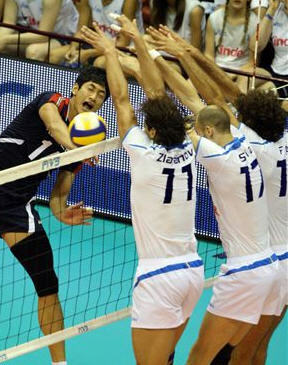 Imagine you are in the game, jump up and block the opponent’s right side hitter. After landing you need to back up because your defense got the ball up. Back up way beyond 10 feet line to get a full approach, you need at least around 11-14 feet to do a full approach. Then imagine your setter has the ball – and you have to make another spike approach. And after the spike approach, you prepare to block again. Keep doing it many times in a row. Start slowly so you learn how to turn off the block properly. This page shows few examples how to practice the transition. If you want to know the details for transition, go to Volleyball Skills section and transition pages. One complex transition variation occurs when players form triple block to the right or left side. I.e. when forming a triple block to the right side, an outside hitter really is in a hurry to back up to swing the outside swing. It often makes more sense to call "inside set" from the setter, because it is almost impossible to hit outside swing after forming a triple block to the right side. The third scenario is when you visualize yourself not blocking, but backing up to play defense. You back up to play defense somewhere around the ten feet line to defend the angle swing. The exact spot naturally depends on the defensive scheme. Then after defense, you back up to do your spike approach. As an outside, right side or opposite hitter you should practice all these three scenarios. Preferably both on the left and right side. Middle blockers definitely need to practice transitioning on both sides since they have to block left and right sides. Example 1: If you do have a setter or ball feeder have him/her tossing the set for you (after you have mimiced a block jump or defensive play). Example 2: To make it even more game-like have somebody tossing the ball for the setter (after your block or your team’s imaginary defense). Example 3: Or alternatively somebody could be hitting the ball at you over the net – and after the defense you perform your spike approach when the setter sets the ball. In the video there is an excellent example about volleyball transition. The first transition appears between 0.06 and 0.11 in the video.Pay attention how the player turns around by opening up toward court. Then she takes a few quick steps, and is ready for another spike approach. To find more technical details about transition, go to Volleyball Skills page, scroll to the bottom and you find transition article under Volleyball Spiking category. 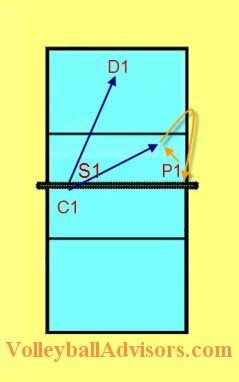 C1, the Coach or Player as an outside hitter swings the ball to angle at the P1 in transition, or hits the ball to zone 6 to a defensive player who passes the ball to the setter. The player performs from a blocker to a defensive player – and from the defense to a hitter transition – and spikes the ball when the setter sets outside. C2, the coach or player on the right side swings the ball to the zone 6 defender, or every once in a while to the block of the transitioning player to remind him/her to form a steady block. (Obviously, C2 could also swing the ball to zone 1 or zone 5 defensive players). The player performs blocker to hitter transition – and hits the ball the setter delivers outside. Important! To make these both drills more game-like, a middle blocker should be used in the block, then transitioning to hit the quick ball in the middle. Also you should add the block against the transitioning hitter. Add the block in the very beginning for the hitters. The hitters should practice hitting against the block as much as possible. 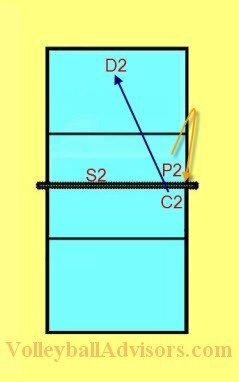 C1 and C2 could use the same drill to practice the right side transitioning by moving the blocker/hitter to the right side. In that case the setter would be a back row player and coming in from the back row to set the ball for this right side hitter. If players are skilled enough and able to swing accurate swings, remember to use players as the hitters. It is an opportunity for the players to hone their approach and hitting skills. How to Make These Volleyball Transitioning Drills More Game-like? The coach could be running these drills in the beginning phase when introducing the transition. When the skills allow, the coach need to start adding elements and making the drill more and more game-like. Example 1 - Double Blocks: Add the middle blocker next to the transitioning player. They place a block together and make the transition after the block. Example 2 - All three blockers: C1 and C2 could be using all three players in the front row and work on the left side and right side transitioning/blocking at the same time. When the opponent hits right side, the outside hitter blocks and the right side hitter plays defense - and the other way around. The setter could a front row or the back row player. If the setter is in the front row, the setter could have the option to set the ball for the opposite hitter in the zone 1. Volleyball Transition Drills - How to Rotate the Players? Remember to change the transitioning player often. 5-7 transitions in a row with a fast tempo makes any player exhausted. As an alternative you could have i.e. 1-3 players to wait their turn on each spot – and switch the transitioning player after each transition. Volleyball Blocking - How to Put the Ball Down?